It was April 2016, and my friend Leslie Gottlieb and I were flying home from the Living Beyond Breast Cancer Conference on Metastatic Breast Cancer. Leslie lived in Minneapolis, too, but I didn’t know her very well until we spent time together during the conference. Our plane home was delayed, and we started talking about the conference and how much it meant to us. It was Leslie’s first time attending. She loved the medical information and the opportunity to meet others with metastatic breast cancer. I talked about how much I loved doing the Hear My Voice advocacy training and how attending the conference for the first time a year ago had affected me. We both cherished the opportunity the conference provided to meet others with metastatic disease and the friendships we made. I started talking about how great it would be to do something similar in Minneapolis. We both had connections with the Masonic Cancer Center at the University of Minnesota, and Leslie sat on the board for the Susan G. Komen Minnesota affiliate, though I didn’t know it at the time. I loved what I had learned at the Hear My Voice training and approached LBBC about working on a conference together. I didn’t want it to conflict with what LBBC was already doing, but rather to bring what they provided to the Midwest. It’s difficult for many in our area to make it out east. Before you knew it, we had the beginnings of the Midwest Metastatic Breast Cancer Conference. The first program was held November 2017. We had over 120 people in attendance and a waiting list. 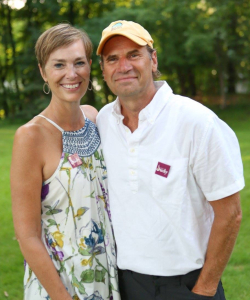 It was obvious that Leslie and I had not underestimated the desire and need for connection and education in the Midwest among people with metastatic breast cancer. Living with metastatic breast cancer is not for wimps. It’s terrifying, and finding the balance between living and knowing you have a terminal illness continually throws you off balance. I’ve described it as doing Tree Pose in yoga . Some days you feel strong and the balance comes. You don’t wobble, you don’t fall. You feel centered. Other days, you go back to Tree Pose and you just can’t make it happen. You struggle, you fall, you get frustrated and you have to try again. Yoga teaches us to not judge ourselves. To not get frustrated when we fall but to get up and try again, without judgment. It teaches us to be kind and gentle with ourselves and to be forgiving. For me, it’s a great description of how I handle living with this disease. I surprised myself when I signed up for the Hear My Voice training. A part of me thought, “Why sign up for advocacy training when I might not be here that long?” But another part of me had hope and thought, “Why not?” I’ve always had an affinity for the underdog, and having metastatic disease feels like being the underdog. I’ve been told breast cancer is supposed to be one of the “good” kinds. We’ve had so much pink marketing over the last 20 years. When I was first diagnosed with stage Ia breast cancer in 2006 at age 43, I thought, “No big deal. I’ve got this.” I could see the TV commercial images of women smiling and wearing pink in my mind. They made it seem so easy. They had breast cancer, but they were almost happy about it. 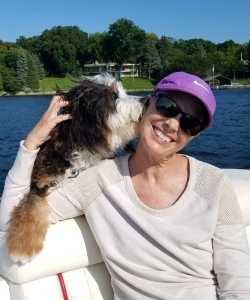 I knew next to nothing about metastatic breast cancer, so it was a shock when I learned the cancer had metastasized to my bones a few days after my 5-year follow-up. I had stage IV breast cancer . That wasn’t going to change. If I had to go through this, then I wanted something positive to come out of it. I wanted to help others. Advocacy seemed like a great way to make this happen, and it gave me hope that I could make a difference. Hope is a weird thing to talk about when you have a terminal illness. But hope is important. I believe not having hope leads us to despair and depression . There are always reasons to be hopeful. You can hope your next treatment will work for a long time. You can hope you reach No Evidence of Disease, or wonderful NED. You can hope for a pain management plan that works, and you can hope for a good day that you spend laughing with friends. I don’t believe hope means you aren’t realistic. Being hopeful means you are very realistic, but you also have optimism. I call myself a realistic optimist. I know what my ultimate reality will be with metastatic breast cancer, but I’m still hopeful I can live a meaningful life. Being an advocate helps me feel my life has meaning. Being a part of creating a conference that brings people together to learn and connect is full of hope for me. 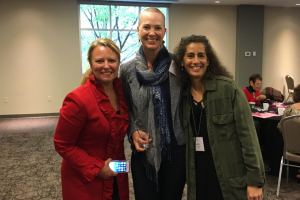 In 2018 we held our second Midwest Metastatic Breast Cancer Conference. Our attendance doubled. It was also a very difficult year. My co-chair and dear friend Leslie passed away from metastatic breast cancer in September. I wondered, how would I handle the conference? Could I hold it together? Would I break down in tears? How was I going to get through the day? Instead, I learned it was a “both/and” kind of day. My therapist, Kelly Grosklags, LICSW, BCD, taught me it’s not an “either/or.” I both cried and had one of the best days of my life. I was so proud of Leslie and what we had accomplished with the help and support of LBBC, Komen Minnesota and the Masonic Cancer Center. People came up to me all day to say how important this conference was to them and how wonderful it felt to be able to talk to others with metastatic disease, and to be understood. I was filled with joy and gratitude. I saw Leslie’s smiling face, and felt how thrilled she would have been to know others were being supported and feeling hopeful. You’re probably thinking, whoa: putting on a conference seems way out of my league. I don’t think advocacy is for me. Well, putting on a conference felt way out of my league too, but somehow, one step at a time, it happened. Leslie and I just kept talking and taking baby steps, and pretty soon we had a whole bunch of talented people supporting us and helping to make our dream a reality. I believe advocacy is important for every person living with metastatic breast cancer. At the very least, you can be an advocate for yourself. You can stand up and make sure you are heard if your pain meds aren’t working or if you’re not sure about your next course of treatment. You don’t have to be a difficult person, or disrespectful, when you advocate for yourself. Be kind, be empathetic to other people’s point of view. But stand up for yourself and make sure you feel heard. Doctors are human. They have good and bad days, just like us. We need to give them a break once in a while. I believe we have responsibilities in our own treatment. We can’t just give over our personal responsibility to our doctors. We need to work as a team, be respectful of each other and work together. You can advocate every day in other small ways. Your story is important. Share it with others. So many don’t understand the realities of metastatic disease, and that affects how much money goes toward research funding. It’s not just about metastatic breast cancer, but all metastatic cancers. Many people ask me how I deal with this disease. It’s not always easy. I’ve had some pretty crappy news the last month, and it’s incredible how fast my pain levels have increased. I’m afraid for how bad it could get and how I’ll handle it all. I wonder if 2019 will be the year they put after my dash, and then I remember my rule about living in the present. I’ve learned that when I dwell on “what ifs” and “should haves,” I find myself going down the road to depression and regret. If I look too far forward, I get anxious and afraid. The trick for me is to stay centered in the present moment. There I can find my balance, and I find I can handle what’s happening right now. When the fear gets to be too much, I turn to gratitude. I’ve learned fear can’t exist when I’m feeling grateful. Sometimes, I’m so far down the rabbit hole of fear and depression that I have to start small. If I feel like I’m lying in a pit of mud, I lift my head high enough to find that one small blade of green grass I can be thankful for, and I start there. Judy Erdhal is a graduate of Living Beyond Breast Cancer’s 2016 Hear My Voice class. Her therapist, Kelly Grosklags, will be one of our keynote speakers at the 2019 Conference on Metastatic Breast Cancer. Apply to our 2019 Hear My Voice advocacy program or learn more about the conference; registration is now open.